Based on the successful video game, Need for Speed is about a group of blue collar young mechanics lead by their all American good guy friend Tobey Marshall (Aaron Paul of Breaking Bad fame). To drum up extra income for their financially troubled garage, the group participate in illegal street car races. When arch enemy (for unexplained reasons) Dino Brewster (Dominic Cooper) returns home, a race ensues that changes all of their lives. Cutting to a few years later, Tobey decides to get the band back together to race in the ultimate underground street race organised by Maverick race enthusiast Monarch (Michael Keaton on Beetlejuice form). Tobey is once again pitted against Dino though this time Tobey has a car of his own design with the car's custodian Julia (Imogen Poots) insisting on going along for the ride. Need for Speed capitalises on all the good will of The Fast and Furious franchise and the likes of Gone in Sixty Seconds. The film is at it's best when in the cars, with the stunts being impressive and immersive. However, unlike The Fast and Furious or Gone in Sixty Seconds the use of humour is barely, if sparingly applied during Need for Speed. Tobey is in good guy blue and white while Dino all but twirls a dastardly evil moustache in his head to toe and wall to wall black and red colour coding. There is a character called Little Pete (Harrison Gilbertson) and one does not have to stretch one's imagination far as to how long Little Pete will survive in this high speed world. Imogen Poots makes a silk purse out of a token female role while Scott Mescudi as Tobey's friend Benny plays to most of the African American screen comedy stereotypes whilst materialising aircrafts at will. 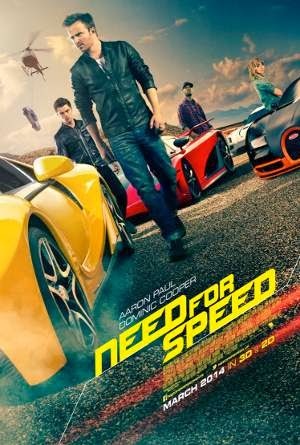 At 130 minutes Need for Speed could have been better were it gone in 60 minutes and though the cast boasts the known talents of Aaron Paul, Poots and Cooper, the script is subpar at best and plan dull at worst.